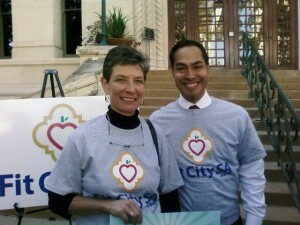 Dr. Annette Zaharoff and Mayor Julian Castro at the Fit City S.A. press conference. As a member of the Mayor’s Fitness Council, Dr. Zaharoff supports Fit City S.A., encouraging San Antonians to get up, get out and get moving! Visit the SA Balance link below for complete details. “Getting Athletes Back in the Game“, Dr. Annette Zarahoff, M.D.